A little girl, named for the memory of the elephant, tells her life story, and thus the story of African peoples from where it truly begins--the beginning of time! Her memory stretches back as far as the stars, to the movement of her family across the globe, to the building of great civilizations, and onto her journey across the Atlantic. "Memories of the Little Elephant" weaves centuries of time into one seamless story and builds self-esteem through cultural identity! Nehprii Amenii, is a student of Khepra. She has studied under the Seba of the International Khepran Institute; her work as an educator, artist, and writer is rooted in ancient African philosophy and spirituality. She received her Bachelor of Arts in Creative Communications from the University of Minnesota. 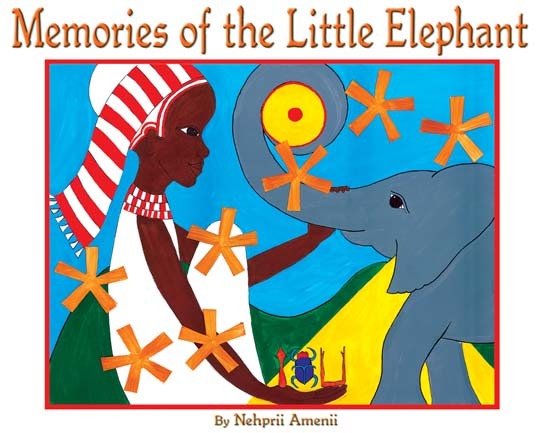 "Memories of the Little Elephant" is a cumulative expression of the experiential knowledge Nehprii has gained over the past decade immersed in self-study and community-building. Her approach to education is based on nurturing the Spirit of the child and organic ways of knowing. As an educator, she has observed the critical link between cultural identity and self-confidence and their impact upon the educational process. "Memories of the Little Elephant" is written to enhance that impact. Her artistry reveals harmonic beauty through dense symbolism. As a curriculum developer she combines creativity, cultural identity, and practicality to engage higher consciousness and academic enthusiasm. At the root of her various accomplishments, Nehprii s passions span from working with her hands in clay, vibrant colors, mask-making, and story telling through puppetry arts. More than anything else Nehprii simply enjoys being with, talking with, and laughing with her family. She prides herself most in being a wonderful Auntie to her precious precious nephews! Nehprii Amenii currently teaches in the New York City public schools and shares her passions with the Alvin Ailey American Dance Foundation's Arts in Education department, creatively teaching life skills to urban youth. She lives in Brooklyn, NY.